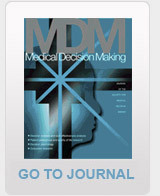 SMDM’s Annual Meetings provide a highly interactive forum for discussion of novel research based on decision and behavior theory and analytical models applied to health related decisions. 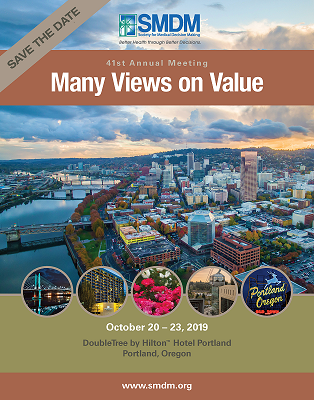 Presentations of original research, keynote talks, special symposia and short courses will offer attendees the opportunity to explore diverse topics in medical decision making. With over 500 – 600 + attendees from a variety of backgrounds and academic disciplines, working in hospitals, universities, corporations, foundations, and government agencies across the globe. Our audience will include senior researchers, educators, clinicians, managers, policy makers, practicing clinicians, cognition scientists, safety officers and risk managers, informatics professionals, clinical and basic investigators, educators, and trainees. Attendees will also include representatives from our Institutional Membership which have included Amgen Inc., Archimedes, AstraZeneca R&D Lund, Biogen Idec, Bristol Myers Squibb, Center for Disease Analysis, Eli Lilly and Company, Express Scripts, Inc., F. Hoffman-La Roche, GE Healthcare, IMS Health Care, Merck & Co., Novartis Pharmaceuticals Corporation, Pfizer, Schering- Plough Corporation, Treeage Software, University of Toronto THETA Collaborative, VA Technology Assessment Program (VATAP). Exhibits will be located near the poster sessions for maximum exposure time to meeting attendees. Exhibit space is limited to table top only. Exhibitor Registration, continental breakfast and coffee breaks are included. Lunch and dinner are on your own. Exhibit Hours are the Sunday Evening Welcome Reception and Monday through Wednesday, with the most traffic during the welcome reception and poster sessions. If you have questions on Exhibit & Sponsorship Opportunities, please contact info@smdm.org.